Rent a backdrop or draping for your Chicago event. 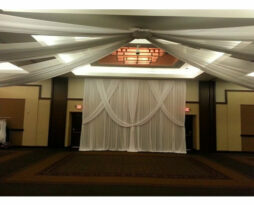 Draping can be used for a fundraiser, gala, wedding reception, corporate party, or even a product launch. 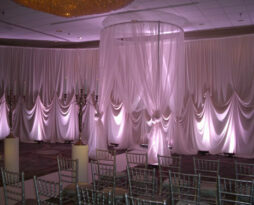 We offer draping in many heights, widths, and sizes. 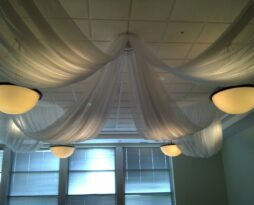 Rent draping for your Chicago event in our standard White, Black, or Ivory. Splash it up with Red, Blue, and so many other colors. An acrylic chuppah, also huppah, chupah, or chuppa, is a WEDDING canopy under which a Jewish couple stand during their Jewish wedding ceremony. 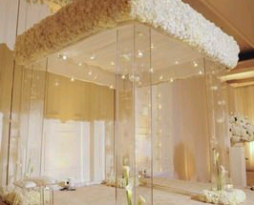 A Jewish traditional square rental chuppah has a top or “ceiling/roof” which is represented within the Jewish ceremony. This same item can be used with or without a top for a non-Jewish wedding canopy for any religious or non-religious ceremony. This item provides that added touch of beauty and reverence for your ceremony as a key focal point for all your guests. These items listed here are your more common Chupppah's/canopy rentals in Chicago. We can create your own custom vision using many other items like chandeliers, crystal beading, layered colored fabrics, candles, glass candle votives etc. Call us to explore how EP can create a unique vision for your special event. Square ACRYLIC Chuppah's and canopies are very commonly used in wedding ceremonies and sometimes left for the wedding couple over a sweetheart table during a wedding reception. Need a custom color designer backdrop. We carry many colors of backdrop panels, call us to ensure we have the color you need. Common colored fabric panels in our inventory are: Silver, Gold, Royal Blue, Navy, Yellow, Red, Burgundy, and Pink. Use this item to wash out and eliminate your room walls. You can transform an event space using simple and effective wall room drape. You can send us a picture or pick from a backdrop we have designed for a previous event. Standard designs you see on our site or on our Pinterest boards can be selected. 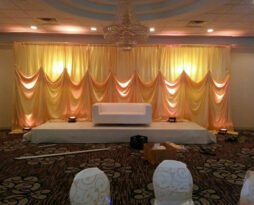 This includes valances, drape pulls, swagging, pinned backdrops, adjoining etc. Our panels look just ironed when put up because we use very high end fabrics that have special textiles sewn in that dramatically reduce wrinkling. Common uses: Custom backdrops for weddings and wedding receptions, room drape for industrial buildings or for tradeshows, straight simple backdrops as room separators, or for whatever reason! To add a specialty drape design to a room or wall drape, call us for specific pricing based on look desired. The price of the room drape is configured PER LINEAR FOOT. If you want to cover a wall that is 12′ tall by 40′ wide, select the 11′-16′ Height in the drop down and 40 for the quantity. Minimum length requirement for this item is 40 linear feet in length. Select the straight backdrop product for draping less than 40 feet. The crystal beaded designer wedding backdrop at your ceremony or reception is a statement maker. This custom backdrop is one of the most beautiful backdrops seen in wedding photographs anywhere. The crystal detail beading catches the light from all parts of the room and sparkle like diamonds. Adding a simple design element to the fabric really adds to the crystal backdrop. This rental backdrop must be ordered in multiples of three feet in length. We highly recommend adding up-lighting to this backdrop as it really show the crystal details so that every guest is captured by its presence and beauty. The price of the room drape is configured PER LINEAR FOOT. If you want to cover a wall that is 12' tall by 20' wide, select 20 for the quantity. Minimum length requirement for this item is 12 linear feet in length. Need a ivory wedding backdrop rental for your ceremony or wedding reception? EP can create a new style backdrop, copy a past backdrop we have created, or even create a backdrop design using a picture that you may have seen that you love! See our pinterest site for 100’s of different options for designs. Use white wedding backdrops to wash out and eliminate your venues plain or un-pleasant room walls. You can transform an event space using simple and effective wedding backdrop rental. Standard designs you see on our site or on our Pinterest boards can be selected. This includes valances, drape pulls, swagging, pinned backdrops, adjoining etc. Our panels look just ironed when put up. Our panels look just ironed when put up because we use very high end fabrics that have special textiles sewn in that dramatically reduce wrinkling. Common uses for ivory wedding backdrop rentals: Custom backdrops for weddings and wedding receptions, room drape for industrial buildings or for tradeshows, straight simple backdrops as room separators, or for whatever reason! 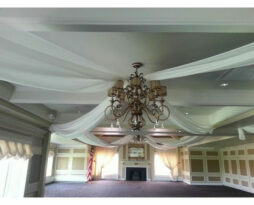 To add a specialty drape design to a room or wall drape, call us for specific pricing based on look desired. The price of the room drape is configured PER LINEAR FOOT. If you want to cover a wall that is 12′ tall by 40′ wide, select the 11′-16′ Height in the drop down and 40 for the quantity. Minimum length requirement for this item is 10 linear feet in length for the total length of all peices. Need a white designer wedding backdrop for your ceremony or reception? EP can create a new style backdrop, copy a past backdrop we have created, or even create a backdrop design using a picture that you may have seen that you love! See our pinterest site for 100’s of different options for designs. 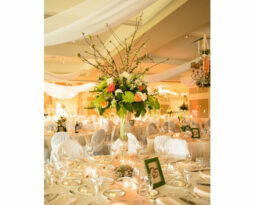 Use white wedding backdrops to wash out and eliminate your venues plain or un-pleasant room walls. You can transform an event space using simple and effective wedding backdrop rental. The price of the room drape is configured PER LINEAR FOOT. If you want to cover a wall that is 12′ tall by 20′ wide, select the 11′-16′ Height in the drop down and 20 for the quantity. Minimum length requirement for this item is 10 linear feet in length for the total length of all peices. Need a curved doorway drape backdrop. We carry many colors of curved door draping panels, call us to ensure we have the color you need. Common colored fabric panels in our inventory are: White, Ivory, Black, Silver, Gold, Royal Blue, Navy, Yellow, Red, Burgundy, and Pink. Use this item to create a grand entrance. 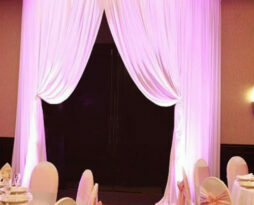 You can transform an event entryway using a curved door drape. 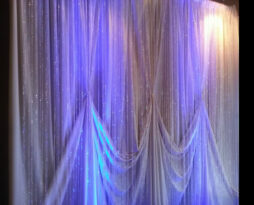 You can send us a picture or pick from a door drape we have designed for a previous event. Curved doorway drape designs you see on our site or on our Pinterest boards can be selected. These doorway drapes are designed to cover a set of double doors, 6 feet in width and up to 10 feet in height. The standard design on this item is pulled back draping panels like you see pictured. Our panels look just ironed when put up. You will never see us take panels out of bins, ours are pressed and hung on hangars in preparation for your event. Common uses: door draping for weddings and wedding receptions, room drape for industrial buildings or for tradeshows, straight simple backdrops as room separators, corporate events, or for whatever reason! To add a specialty doorway drape design to a room or wall drape, call us for specific pricing based on look desired. 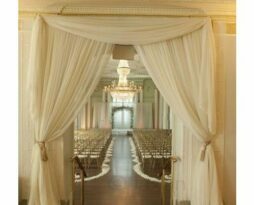 The price of the room drape is 6 feet in width and up to 10 feet in height. By selecting one as the quantity, we assume one 6 foot doorway drape is needed. To extend this to many sections select 1 for every 6 feet of length needed. Please contact us for questions on custom sizes and on other unique curved doorway drapes. Need a straight doorway drape backdrop. We carry many colors of door draping panels, call us to ensure we have the color you need. Common colored fabric panels in our inventory are: White, Ivory, Black, Silver, Gold, Royal Blue, Navy, Yellow, Red, Burgundy, and Pink. Use this item to create a grand entrance. You can transform an event entryway using simple and effective door drape. You can send us a picture or pick from a door drape we have designed for a previous event. Standard straight doorway drape designs you see on our site or on our Pinterest boards can be selected. These doorway drapes are designed to cover a set of double doors, 6 feet in width and up to 10 feet in height. The standard design on this item is pulled back draping panels like you see pictured. 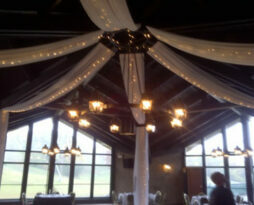 The price of the room drape is 6 feet in width and up to 10 feet in height. By selecting one as the quantity, we assume one 6 foot doorway drape is needed. To extend this to many sections select 1 for every 6 feet of length needed. Please contact us for questions on custom sizes and on other unique doorway drapes.